Here you can find lots of top tips to help with your children’s reading, advice on which books to choose and activities to help make reading what it should be – fun. Plus a list of questions and answers that we hope you find useful. You might not think they take much notice but even small babies find pleasure in language. They enjoy being sung to and love the bond you share as you read aloud. Making time to read with children is key to bringing books to life and will help your child on their way to becoming an avid reader. It helps if your child sees that you enjoy reading too! It really doesn’t matter what it is – a newspaper, website, magazine or book. Out and about, children are surrounded by written signs and soon they will want to know what these say. A great thing to do is point out words and make up a game by asking questions such as “Who can see a ‘C’?” or “Can anyone see an exit sign?” Children also pick up information about reading from the TV – they may recognize the titles of their favourite programmes or the brand names of their toys in adverts. It’s often one of the ways they first learn their letters. A children’s book – apart from being fun – is important in helping children realize that reading isn’t just about learning letters and words, but understanding what a book has to say. School will build on the experience that a child brings with them from home and the teacher will encourage them to develop their own tastes and interests. Children will stand a better chance of doing well in their education if they already enjoy reading and being read to when they start school and are comfortable talking about and using books. There’s no better way to help your child on the path to reading and writing than to read aloud to them. By enjoying books together, children learn how books work, how to talk about the story and the pictures, to join in with parts they know well and to recognize words on the page. All this helps to build up their confidence and interest. •	Try to share books together every day at any time – while waiting at the doctor’s surgery, sitting on the bus or at bedtime. Settling down to look at a book together can be relaxing and rewarding during an otherwise hectic day. •	Introduce your child to different kinds of books. 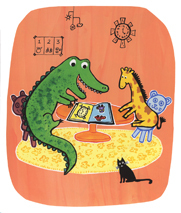 Try traditional and modern stories, rhymes, poetry and songs, as well as factual books. •	Reading aloud will familiarize children with the “tunes” of each story. They will enjoy hearing the predictable rhythm and will sometimes join in by finishing a rhyme, repeating a phrase or echoing what you’ve said. These experiences are a great help when children come to read the words for themselves. •	Encourage your child to choose the books you read to them. They might have a favourite they want to hear every night for a week or even longer – but this is the perfect response to a book as it shows that they enjoy reading it! As children get to know a book they will start to remember the story and join in, especially with repeated phrases. It’s something you can play up to, giving them the satisfaction of guessing the rhyme in a poem or finishing a key phrase in a story. * The books: Discussing the story and pictures will add to your child’s enjoyment and understanding. It’s good if they interrupt your reading by pointing to words or asking about pictures as it shows that they are interested and want to find out more. Help them by saying things like: “Can you guess what’s going to happen next?” or “Why do you like this book so much?” Children will often be reminded of their own experiences and one story can spill out into many others. Talking about books is one of the best ways for children to get involved in stories and to feel like readers. * The pictures: Pictures help to tell a story and, in some books, tell more of the story than the words alone. 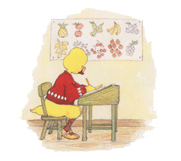 Young children often talk their way through a book using pictures to guide them. Sometimes they use their own words; sometimes they remember the story by heart. This is not “cheating”, it’s just how a child begins to read. As he or she gets older, the pictures will continue to help them make good guesses about words they don’t know. You: What does ‘spotty’ sound like? It’s important to keep re-reading books that are old favourites as familiarity and comfort are vital to a child’s confidence. They gain pleasure and self-assurance from books they know well and re-reading helps them to understand how books and stories work. Familiar books will give them a secure base to explore words and letters and identify similarities, repetitions and rhymes. * Listen to CDs and watch DVDs of their favourite stories. These provide another way to hear the stories again and help your child match the words they hear to those on the page. Young children often get to know a story so well that they can retell it in their own words! * Act out the stories they’ve read using the phrases learned from the book – children rarely need an excuse to dip into the dressing-up box! They can also use toy animals or small figures to help. * Get them to draw a picture of a story and talk their way through it or make up their own versions emphasizing particular characters and inventing what happened next. All these activities give them a chance to experiment with what they’ve learned and make it their own. They are working out for themselves how to be a storyteller and in time, it will provide a strong basis for their writing. Between the ages of four and seven, most children begin to read for themselves. They do this in different ways. Some read the book by remembering the story and making up their own words; others want to get every word right. Some keep going at all costs; others are more hesitant. The key thing is to let your child do it in their own way at their own pace. Some children will need to look more carefully at the actual words; others will need encouragement to focus on the story and worry less about making mistakes. Gradually let them take over as much of the reading as they can. If children get stuck when they are reading, encourage them to have a go and use all the information they have – what they can learn from the pictures, their memory of the story, and their knowledge of letters and sounds – to make sense of the book. There are no hard and fast rules about how much help to provide, work out what feels right for you both. Children learn a lot about reading from their own attempts at writing. When they write, they need to think carefully about how words sound and look. Young children are often eager to write and should be encouraged. As your child grows more confident get them to write as much as they can on their own but be prepared to supply spellings and show them how something looks in grown-up writing. • Prompt them to write their name or create a little story to accompany a picture they’ve drawn. This might look like little more than scribbles to you, but your child will know what it says! • Build on their enthusiasm by encouraging them to write stories using the letters and words they know and encourage them to put their name in birthday cards or by sending their drawings and messages to relatives and friends. • Write down a story for them, or a message for someone else. They learn a lot by watching you write and seeing how you make the letters; but you can involve them further by asking how they think some of the words begin and by reading together what you’ve written afterwards. • Help them make their own little books. They might like to illustrate these or you could take it in turns to write each line of the story. • Let your child to make labels and notices. They may enjoy making their own signs for the different rooms in the house, coat pegs, the door of the fridge or their toy box. “Keep Out!” signs on bedroom doors are particularly popular! Show them how to form the letters clearly so people can read them. Your child’s success at school will depend on the knowledge that they’ve picked up from you at home, including invaluable experiences of stories and books. This learning process doesn’t stop and your child will need just as much – if not more – help and encouragement with their reading at home. Continue to read to your child as often as before and help them explore books they might not get from school. There’s no need for reading to become a serious business at this stage. * The teacher will want to know what books your child enjoys rhymes and stories, their knowledge of the alphabet and whether your child likes to write. * Most schools know how important parents are to reading development and regularly send home books for children to share with their families. * Some schools even invite parents to help their child choose books from school at the beginning or end of the day. * Home–school notebooks are a common way for parents and teachers to communicate. They will come home with your child and give you the opportunity both to make your own comments about what your child has been reading and with what success, and to see the teacher’s comments too. It’s a really effective way of monitoring progress, identifying potential problems and generally nurturing your child’s reading skills. * Many schools welcome parents into the classroom to read to the children. It’s a really good way to learn about your child’s experience and give valuable support to them and other children, so it’s a good idea to get involved if you can.